Green Roof Systems goes beyond the fashionable green roof movement and provides solid information on building accessible space, often as important public space, over structure. It offers brief coverage of the entire process, including planning and collaboration, and focuses on the technical aspects of these roof systems, their components, and their applications. Susan K. Weiler, Fasla, is a partner at OLIN, a landscape architecture and urban design firm based in Philadelphia, Pennsylvania. She lectures widely and teaches landscape architecture at Temple University, where she developed its landscape engineering and construction curriculum. She is the recipient of the 2003 Green Roof Award of Excellence. Katrin Scholz-Barth is a consultant from Washington, D.C., currently working to help establish green roofs in the Middle East. A national expert in green roof technology, she leads efforts in ecological planning and design both in the United States and the Middle East. She taught at Harvard University and the University of Pennsylvania and is former director of sustainable design for the HOK Planning Group, a business unit of The HOK Group, Inc. She is also the recipient of the 2003 Green Roof Award of Excellence. Chapter 1 Replenishing Our Diminishing Resources: Integrating Landscape and Architecture. Chapter 2 Beyond the Property Line: Ecological, Economic, Spatial, and Social Benefits of Green Roof Systems. Chapter 3 Envisioning Green Roof Systems: From City Scale to Project Scale. Chapter 4 Green Roof Systems at the Project Scale: Site and Architectural Considerations. 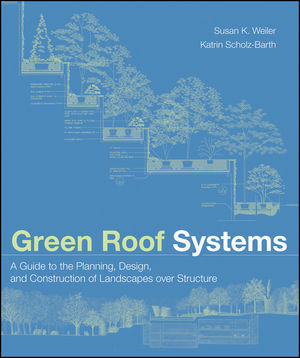 Chapter 5 Considerations in Developing Structural Systems for Green Roof Systems. Chapter 6 Component Parts: Inert and Dynamic. Chapter 7 Putting the Parts Together: The Design and Documentation Process. Chapter 8 The Bidding and Construction Process. Chapter 9 Minimizing, Managing, and Insuring Risk. Chapter 10 Maintenance Requirements and Performance Evaluation.